Sometimes you just need to go back to basics. A few (very insane) weeks ago I was still figuring out how to do things for myself after my surgery, just coming back to work (officially) full-time, rehabbing, and getting ready to head out of town for over a week. In short, I was pretty dang tired and feeling very “meh” about cooking or anything else that required even an iota of non-essential energy. But I was also trying to get back to a normal life, including eating a lot healthier. While I was recovering from the surgery, convenience became a huge focus, so I ate a lot of Kashi pizzas, rotisserie chicken, and packaged ravioli. Not terrible, but not great either. So I told myself that ordering Thai food wasn’t an option and tried to find the next-easiest thing. That’s when I thought about a frittata. The thing is, they feel kind of fancy, but they’re so simple. And you can make them out of almost anything. Seriously. Dump a bunch of leftovers in there, it’ll be great. I made it with leftover mac & cheese once, and it was awesome. Honestly, the only thing I had to actually pick up at the grocery store that Sunday was the beet and the leek, because I wanted to try something a little different. You may remember the frittata with goat cheese, sweet potato, kale, and red pepper, wherein the diced sweet potato and leek kind of caramelized on the bottom of the pan, forming a delicious crust. 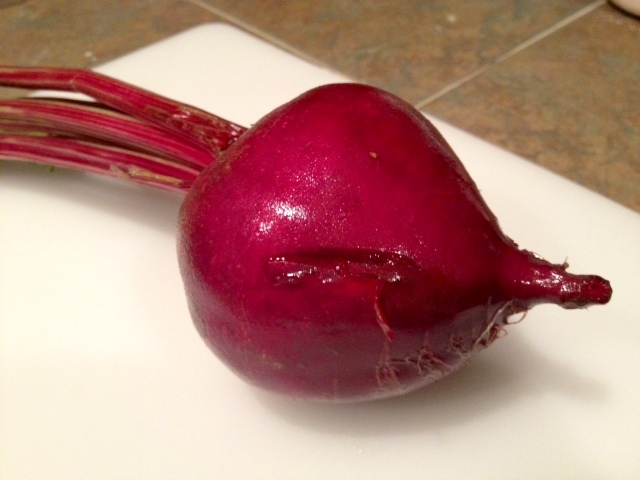 I’ve been meaning to try cooking with beets, so figured this was a great opportunity. 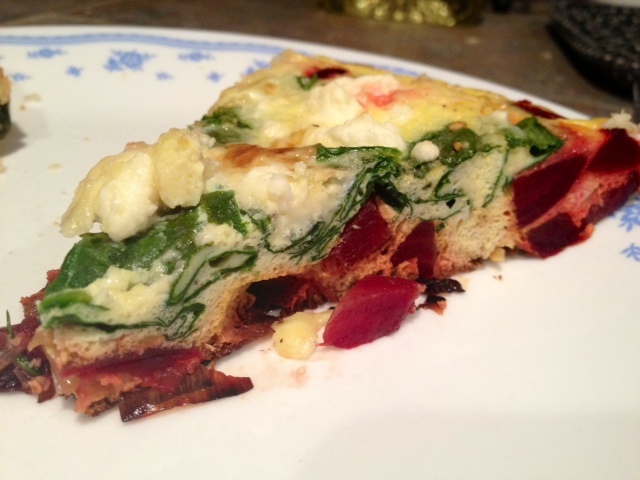 But I had spinach in the fridge, a little bit of leftover feta sitting around, eggs, and cheese. What more do you need?? 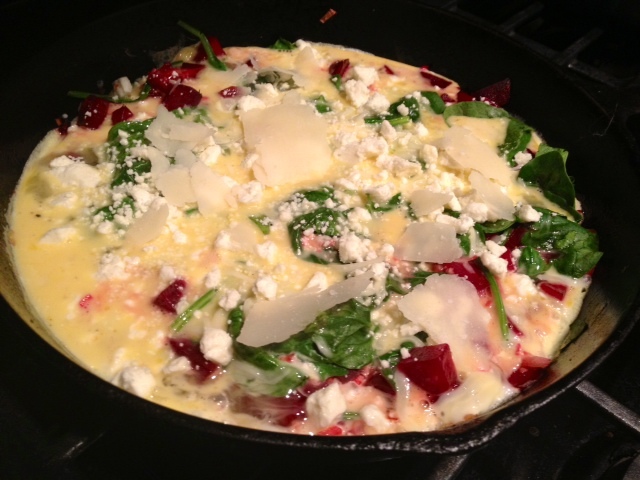 The beet was interesting in the frittata. One thing I didn’t anticipate was that it’s a little more watery than a sweet potato (so not as much caramelization), so I should have maybe patted the diced beets dry before cooking. Or even maybe roasted them. My first choice would have been a golden beet, but all they had was red (which stains everything). It was still great, and a nicely-different flavor combination. 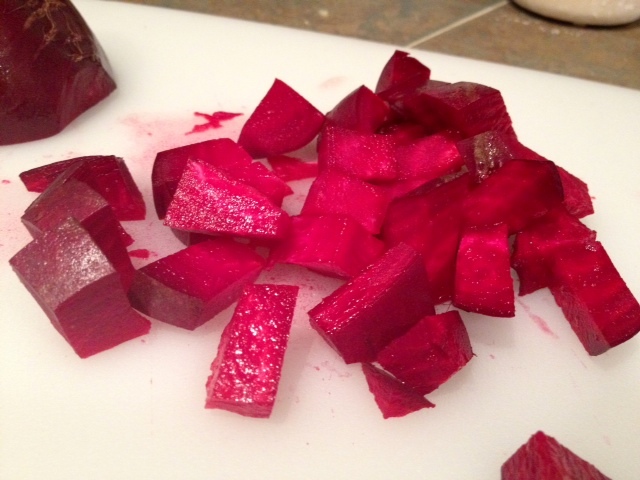 Cut off the top and tip of the beet, and dice in small, even pieces. This will make sure it cooks evenly and quickly. But be careful and use a crummy and/or easy-to-clean cutting board because the beet juice stains everything. EVERYTHING. Heat an oven-safe skillet (I use cast iron) on medium or medium-high heat, and give it a generous dollop (about 1-2 tablespoons) of olive oil. 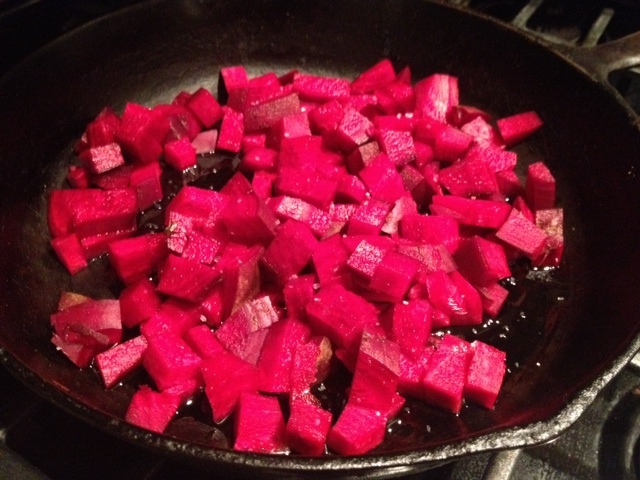 Add the beets to the pan and saute for 8-10 minutes, until they soften. 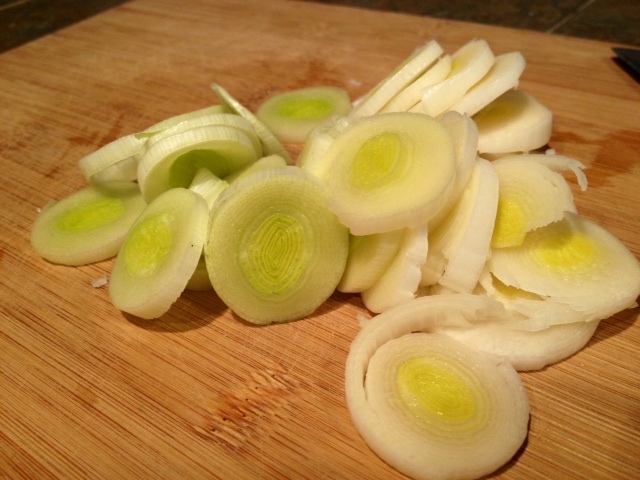 In the meantime, slice up the white and pale green parts of the leeks (discard the greens and tip), and roughly chop them—rougher than this picture shows. Add to the softened beets and cook for another few minutes, stirring to get everything cooked. 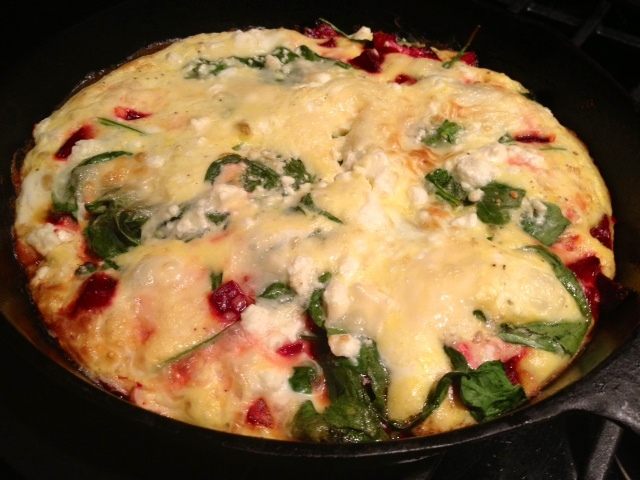 Then pat everything down into the pan to form the bottom layer or “crust” of the frittata. No more stirring. In a large bowl, blend the eggs, milk/cream, salt and pepper. I used an immersion blender. Then stir in the mozzarella with a fork or spoon. 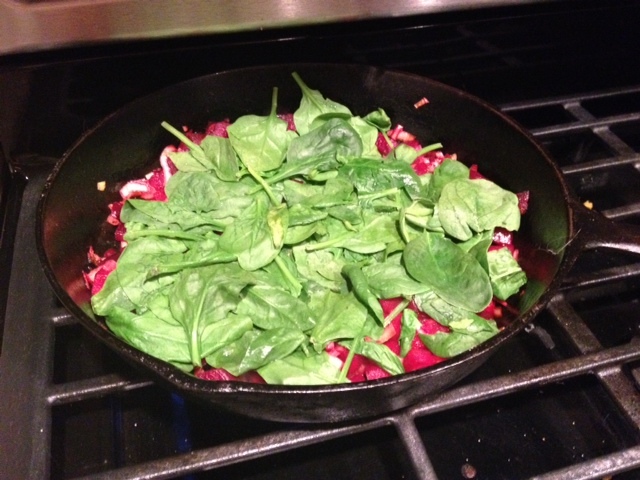 Add the spinach to the pan for just a couple minutes and cover, until it wilts a little. Pour the egg/cheese mixture into the skillet, making sure the egg spreads around fairly evenly. 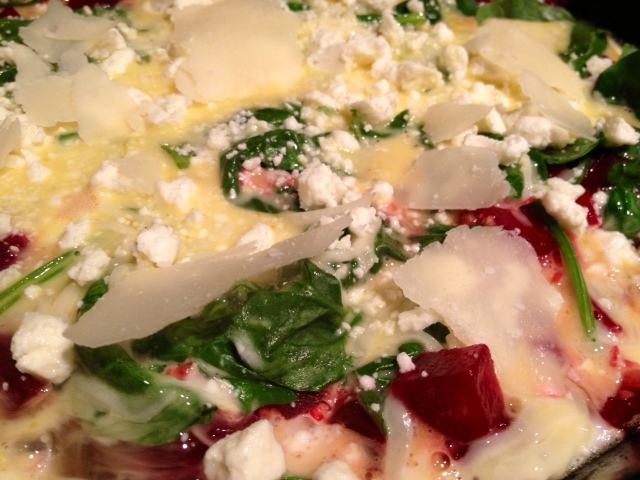 Sprinkle the feta on top (and some parmesan shavings, if the whim strikes you). 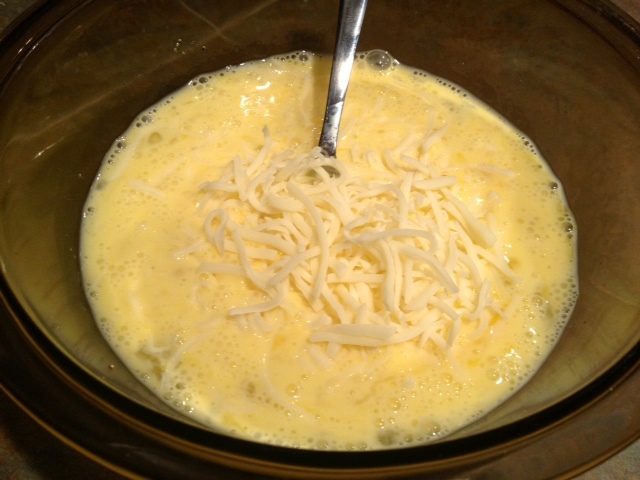 Once you’ve added the eggs and sprinkled on the cheese, turn the heat down to low. 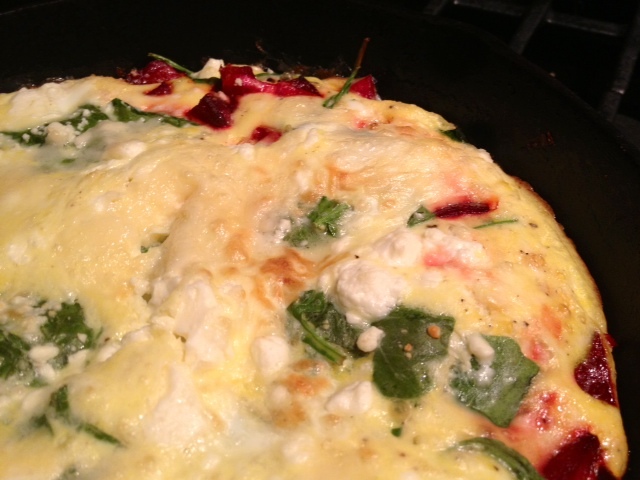 Let the frittata cook for just a couple minutes on the stove, just to set the edges. Then place in the oven to finish cooking. Depending on your oven and type of pan you’re using, it’ll take 10-20 minutes to bake, so keep an eye on it. It’s done once the middle isn’t runny anymore (but it can jiggle a little, totally okay). If you can shake the pan and see that the middle is just barely set, you’re golden. Remove from the oven, letting it cool before serving. Not only are frittatas awesome right out of the oven, but they make a great take-to-work breakfast during the week, and heat up nicely. They’re chock full o’ veggies and protein, which will keep you going during a long work day. Dice the beets in small pieces. Be careful—the beet juice stains everything (including your cutting board)! Heat an oven-safe skillet on medium or medium-high heat, and give it a generous dollop of oil. 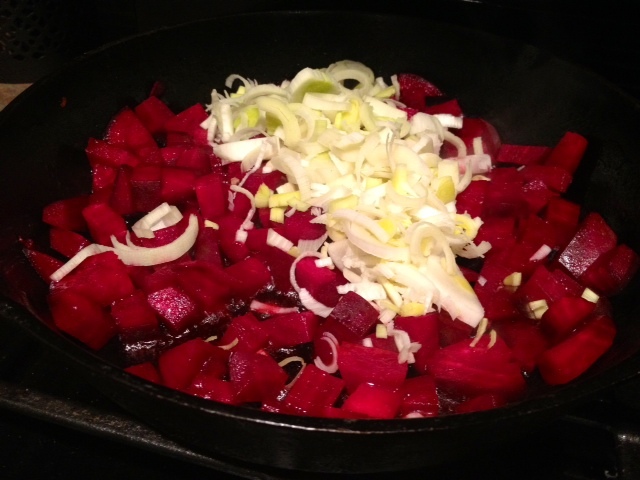 Add the beets to the pan and saute for 8-10 minutes, until the beets soften. 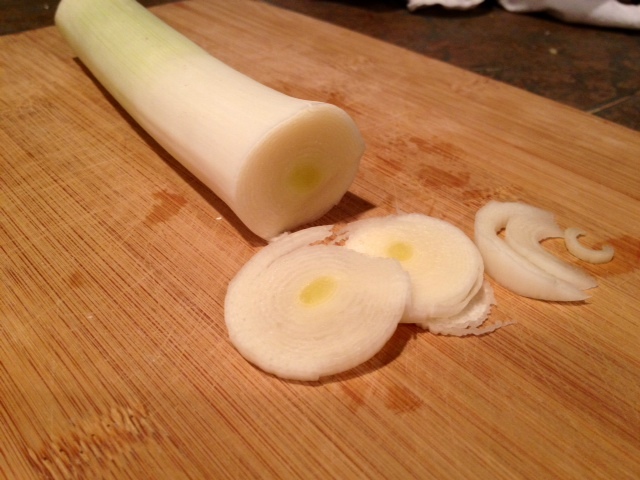 Slice up the white and pale green parts of the leeks, and chop them semi-fine. Add to the beets and saute for another few minutes, stirring to get everything cooked. 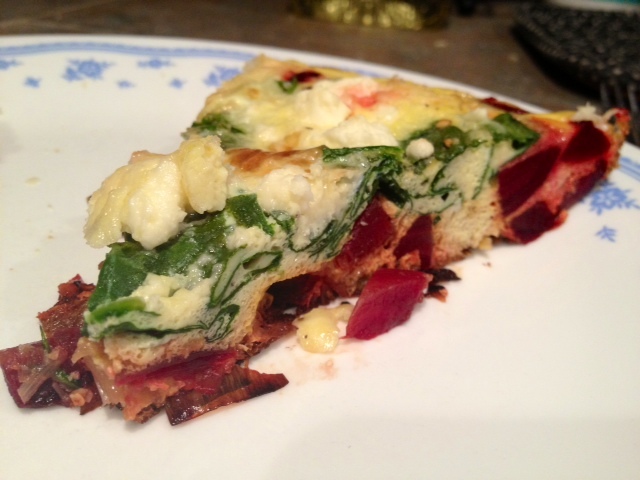 Then pat everything down into the pan to form the bottom layer or “crust” of the frittata. Add the spinach and cover for a couple minutes, until the spinach is wilted. 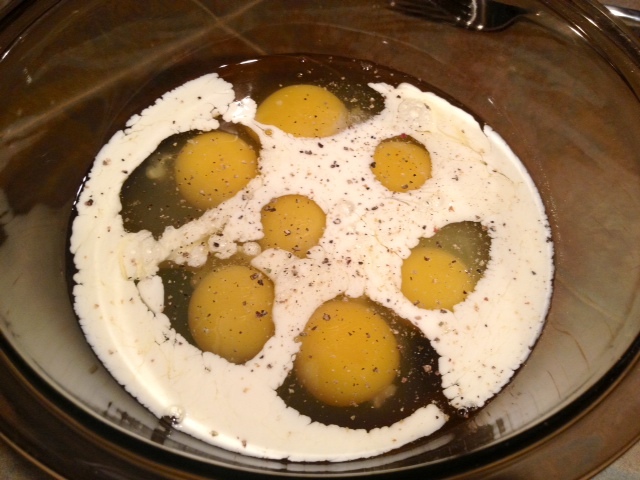 Preheat the oven to 425 F. In a large bowl, blend the eggs, milk/cream, salt and pepper, then stir in the mozzarella. Pour into the skillet, making sure the egg spreads around. Lastly, sprinkle the feta on top (and the parmesan, if you’re using it). Turn the heat down to low, and let the frittata cook for a couple minutes on the stove, just to set the edges. Then place in the oven to finish cooking. Depending on your oven, this will take 10-20 minutes, so keep an eye on it. It’s done once the middle isn’t runny anymore, if you can shake the pan and see that the middle is just barely set. Remove from the oven, letting it cool before serving.